Being on a WWI kick the last few years, I’ve been picking up various wargames and they seem to be of two kinds — monster games like 1914: Offensive a outrance, its ‘Serbia Must Die’ brother, and Balance of Powers, and small games like Decision Games’ ‘folio’ series such as Masuria 1915 and Tannenberg 1914 as well as the Marne 1914 game from Turning Point Simulations. I had previously bought DG’s Meuse-Argonne 1918 folio game and enjoyed it, so I picked up Masuria and Tannenberg. I also picked up the monster games, too, but they’ll take more space and time in the future. Knowing little about Masuria, which covers the 1915 Masurian Lakes battle, Dennis and I cracked that open first. It’s a far different game than Meuse-Argonne 1918. 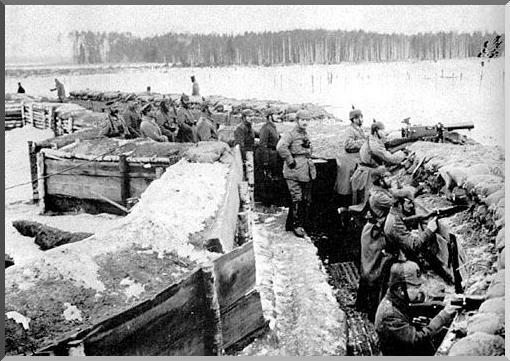 “After the Tannenberg campaign of August-September 1914, East Prussia became a strategic backwater as both side focused their efforts in Poland. GAME TWO: Set Up and Turn 1. Dotted lines are the front line. 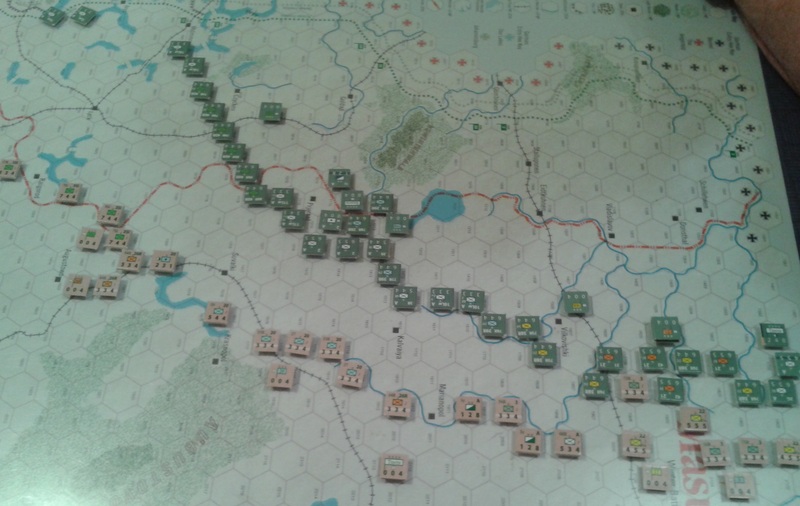 Note the Russian units hugging the right edge of the map – they cover ‘Maltese cross’ hexes to prevent German units from entering behind the flank of the Russians. More Germans are off photo to left. The game includes: One 17×22-inch map, 100 die-cut counters, one Standard Rules booklet for this series, and one Exclusive Rules booklet for Masuria tucked into a cardboard folder. Counters are brigade for infantry, corp-level for artillery, and brigade for cavalry. Each hex is about 4 miles (6.5 km). Each turn is 1 day. Modified I-go-U-go. End of German Turn 2. Germans set up first with most of their army off map, Russians set up second, and Germans move first. I took the Russians and Dennis took the Germans. End of German Turn 3. As you know, the first time or two you play a game, you usually botch the rules. Well, maybe you don’t, but game with me and I’ll introduce you to the concept. If you’ve been reading my AARs, I don’t want to botch things and try not to, but it happens. My bad, sometimes. The rules bad, sometimes. I consider it part of the learning curve. I spread the game out, look at the maps and counters, skim through the rules, and work through the sequence of play on the map while reading the necessary section. My problem comes with rules writers scattering individual rules throughout the ruleset. I am more than happy to see a longer ruleset if, for example, all the movement rules are in the movement section and then individual, special case modifying rules are duplicated in other appropriate sections. To me, better duplication than omission. End of Russian Turn 3. Yeah, it gets ugly. We incorporate changes into the game as we read them, then see how it alters the game. When we get to a point where it’s pointless to continue, we stop and try again. Game the first lasted two turns. Turn one saw a couple German attacks and some successful Russian attacks that use ‘infiltration’ — the ability to move from one zone of control to another if you start in a ZOC. No retreats through an enemy ZOC. All units are in supply all the time, even if cut off. Turn two saw the Germans enter the board in strength and engage the Russians. Masuria (also Tannenberg) uses this hidden movement mechanic on a corp-by-corp basis. End of German Turn 4. The Germans have four entry areas (different colored Maltese crosses) and each corp has a ‘real’ HQ unit and a ‘dummy’ HQ unit. Once either HQ unit gets within two hexes of Russian infantry or three of cavalry, it’s revealed. Unless the Russians pull back from their start line, that usually means the corp units are immediately revealed because the start line is one hex away from the Maltese crosses. However, on the first turn, the Germans indicate which colored crosses a corp will enter…so the real HQ goes on the color the Germans want to enter on while the dummy goes on another color. The outnumbered Germans want corps immediately, but for the first turn, it’s a bit of a guessing game. On an exchange (and there’s a lot of those on the CRT), each side loses one step. Almost all Russian brigades have two steps, but about half the German brigades have only one. The balancing factor is that these German divisions have three brigades instead of two, which helps with the unit integrity mechanic — any unit not part of a division or not in the ZOC of a parent corps HQ is halved when attacking with units of another division. Anyway, Kaiser Dennis didn’t realize a couple of his corps were one steppers and found many combat results of exchange evaporated his combat capability, not to mention opening up holes in his line — ripe for Russian infiltration. He was badly out of position, knew it, and said we should start again. Besides becoming familiar with troops (we both turned over units to make sure we knew which had only one step), we learned about a clever little rule about maintaining adjacent units within a line. It’s a little confusing to grasp, and the diagram in the Exclusive Rules is little better than nothing, but assuming we’re playing it right, it is clever. Even during the third game we were not sure we did that correctly in every instance, but it does offer an incentive to keep a continuous line instead of stacking. This is also one of the few games where most units’ attack value is greater than their defense value. End Russian Turn 4. Pardon the glare. You can augment combat values by using artillery (gets flipped over and needs a roll to ‘resupply’ back to full strength) and/or by using HQs (same flipping and rolling for recovery), but the roll for resupply / recovery is only 1 or 2 on a d6 (+1 if in a town, +1 if on a railroad). I should mention the Russians start with 3 VPs. 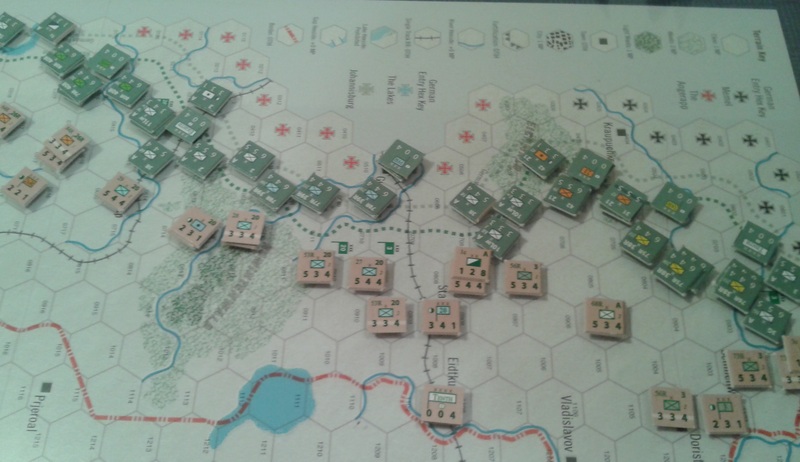 The Germans gain 1 VP for each of the three fortresses on the map. Both sides gain 1 VP per 3 units captured — i.e. forced to retreat through enemy ZOC. We think eliminated units do NOT count (because you can resurrect them next to a HQ), even if a retreat would result in their capture. We may be wrong. End of German Turn 5. Anyway, with lessons learned, we reset the game. I again took the Russians and Dennis the Germans. The Germans pulled back where possible to prevent Russian infiltration. No easy VPs for the Russians this game. The big German tide arrived on Turn two: 4 exchanges, 1 defender eliminated, and 2 defender retreats. Not bad. The Russian line bent, trading space for time, but did not break. 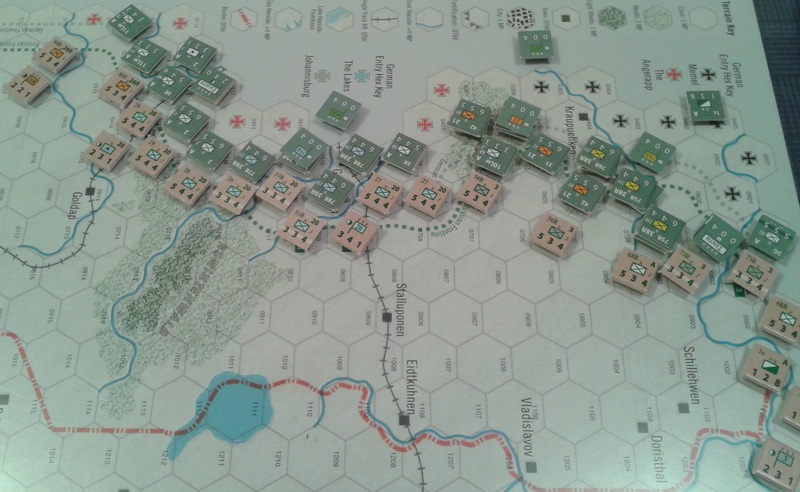 On Turn three, more German attacks with 2 more Russian retreats and 3 exchanges. The Russian line shuffled back a little bit. On Turn four, more shuffling and two step losses for each side. About this time, we’re thinking: how can the Germans ever hope to reach the three fortresses? They come in on the NW corner of the map and the three forts are located in the other corners. It’s a heckuva long way diagonally to the third fortress. Dropping back a hex or two worked like a charm because dead units can be resurrected next to the HQ up near the front line. End of Russian Turn 5. Run, Nicky, run. Here comes Willy! At the start of Turn five, Dennis read the rules again and found a little tiny change tucked in the corner of the Exclusive Rules. I really, really, really, Carly Rae Jepsen really detest DG’s use of separate Standard Rules and Exclusive Rules. Just write one damn set of rules for a game. I shouldn’t have waste valuable wargaming time flipping back and forth between the two sets to find flippin’ exceptions. First off, the Standard Rules are for WWII. Yes, WW Two. So, there’s a whole section on the ‘mobility phase’ (otherwise known as mechanized movement phase). The WWII counters have this big M in a red circle to indicate mobility phase capability. No Ms on the WWI counters. Makes sense. So, that doesn’t apply to WWI…or, does it? End of German Turn 7.I skipped Turn 6 because nothing much happened during the snow turn. Say what? As it turns out, ALL units have mechanized, er, mobility movement, sez designer Chris Perello. That’s a heckuva change from what we were playing. We had problems in the game Visegrad with the word ‘normally.’ If you make a point that something is normal, what’s an ‘abnormal’ something? Why would you NOT do something normally? End of Russian Turn 7. The right flank looks ugly. If no enemy units are in front of them, they can move the other half onto the map. No sweat. But what happens if the Maltese cross hex is in the ZOC of an enemy unit? Can the German units infiltrate? Normally, they can. Can they move out of the ZOC to a ZOC-free hex and then move back into another enemy ZOC? Normally, if they start in an enemy ZOC, they can. Do they stop on the Maltese cross entry hex when entering an enemy ZOC? Normally, they do. Maybe, just maybe, Dennis and me are the only ones who ever came upon this conundrum — or any of the other rules conundrums we came up with. Are we that good? We must be really, really, Carly…oh, yeah, I already used that joke. I suggest this split personality rule format is partly to blame. When you don’t concentrate on one rule set, you lose coherency. You lose the flow of mechanics that need to be explained. And no, I didn’t like it back when SPI pioneered this idea in my youth with Quadrigames. OK, so now we treated all units as capable of mechanized movement, er, ‘mobility phase’ movement if they don’t start movement in an enemy ZOC, plus a second mobility combat phase. Reading the CRT results, we noticed that an attacker can often retreat one hex (no defender follow-up) after combat. So, put the two together and you have mobility phase movement for everybody. Or, to put it another way, Masuria just became an I-go-I-go-Ugo-Ugo game — or more go-go’s than Inspector Gadget. It begs the question why WWII infantry are also not mobility phase worthy, but inspecting that logic is a no-no for now. To be clear, in the mobility phase, units move half (rounded up), there’s no infiltration, and all exchanges are treated as no effect. Panzerkaiser Dennis raced through turn five, crunching the Russians. On previous Turn four, I lost two steps. On Turn five, I lost two steps and had four units surrounded and captured! End of German Turn 8. Pardon the glare again. Plexiglas effect. Uh-oh. That double move is worse than being on double secret probation. Now, we started to understand how the Germans can cut through the Russians and reach the fortresses, or at least surround and capture units for 1/3 VP each. I ran away and set up a line. And then, Snow! Blessed snow. Mother Russia’s great equalizer. 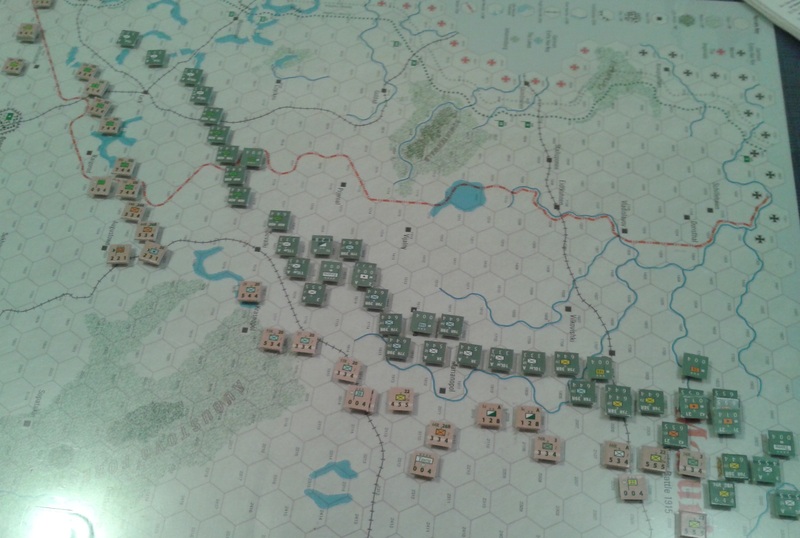 Turn 6 saw the first German (A) result — attacker repulsed and lose one step. Plus an exchange. That’s it. Russia is saved! Also, as Dennis later discovered, replacement steps come in during the mobility phase, sooooo, does snow mean no replacement steps? Rules are mum on that one, too. We said replacements didn’t get in. We may be wrong…and we were. Chris Perello’s answers noted that replacements did come in, although we were a third of the way through Game three before we acted on that. In any case, during Game two the snow didn’t last and then changed into clear on the next turn. 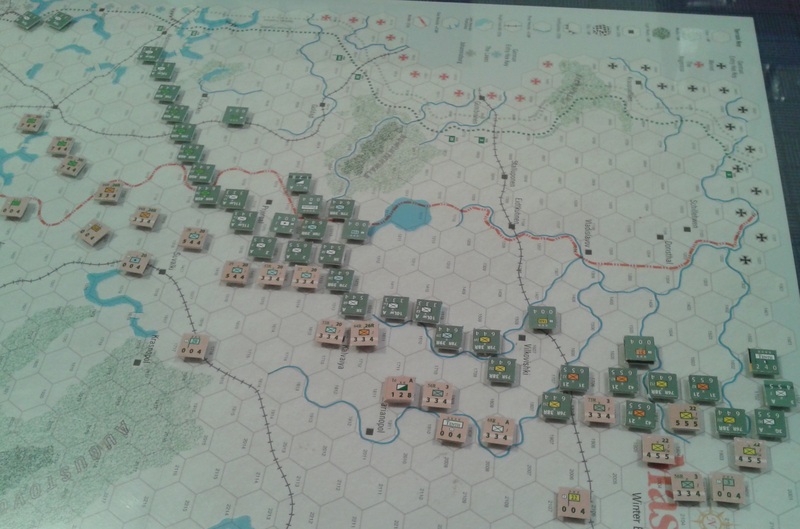 Turn seven, eight, and nine saw a pummeling of the Russians. The double attack proved quite helpful in cracking lines. On turn eight, I brought in a corps (loss of a VP), but something had to be done with half the game over and the right flank collapsing. It was all over for the Russians by Turn 10, so we stopped. 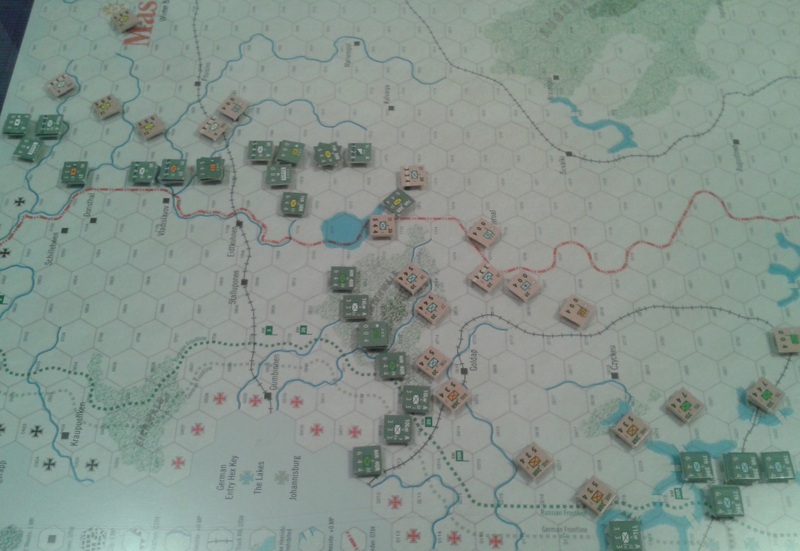 End of Russian Turn 8.Next turn was clear weather, with little stopping the turning of the right flank. A new Russian corps comes in at upper left. Each turn, snow comes on a 5 or 6 on a d6, with a 4-5-6 on a d6 to keep it the next turn. For our Game the Second, 9 of the 10 turns were clear. Snow helps the Russians. A lot. Had the weather been reversed, the Russians likely would have won. We guess that if it snows half of the time, it’s a more balanced game. 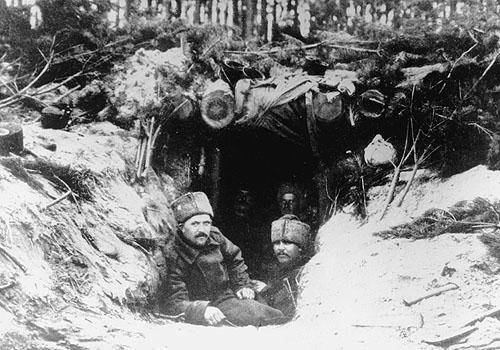 As the Germans, I pulled back into defensible, retreatable positions while launching attacks on the northern end of the Russian line. All was going well until a Landwehr brigade forced to make a soak-off attack (that ‘multihex units in line’ mechanic) botched the roll and lost a step and fell back a hex. That opened up the right flank of the Germans in the north. Dennis and the Czarists, which might be a good name for a punk rock band from Moscow, opted for an aggressive attack, looping a cavalry unit around the line and pressing forward, forming a pocket of Germans despite some disadvantageous die rolls, but well within the striking zone of my next turn German reinforcements. It looked bad because I could pocket the pocketers. He rolled the weather die — Snow! The great horde of German reinforcements chugged to a halt next to the Maltese crosses. This is where the mechanics of entry needed clarification since the Russians were often smack up against the edge of the map. We think we played it correctly when we treated ZOCs as a hard stop, but we also noted that in many cases, we would have had to stop off-map had we moved up ‘normally.’ Indeed, as the answers noted, it is a hard stop unless you can shake free to a non-EZOC. Some units entered into the fight right away, but the grand pocket I envisioned fizzled. Half movement and no mobility phase. The same thing occurred on other areas of the front. The Russians cleverly attacked at awful odds to be killed, because killed units that are technically cut off are NOT counted as captured. I eliminated them the next turn, but only one out of five were surrounded. The other four were eliminated or exchanged to death. The Russians got a partial reprieve. Indeed, it continued to snow for several turns during Game three. Because we were playing that replacements didn’t enter on snow turns, both armies spiraled down to single step units and lines became thin. 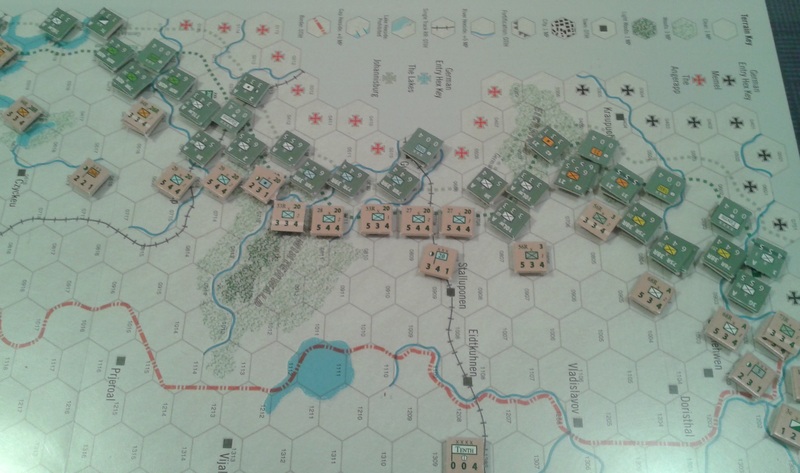 The Germans had more units, and sadly, three surrounded Russian units escaped via Exchange death through CRT results. On the flip side, a Russian effort to vaporize one-step German units in the Nowinterwald (forest) failed, keeping the German right flank intact. Game 3: End of German Turn 6. 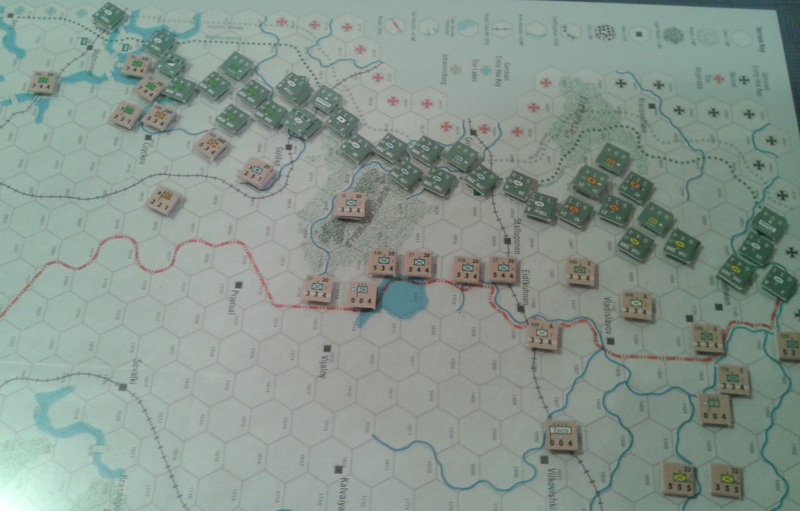 The Russians start to counterattack (note the surrounded German unit) when they decide to call it a battle. The Russians also brought in a corp in the south (off photo to right)On turn 6, clear weather finally arrived and the Germans blasted a hole in the Russian lines and managed to kill off the Russian 10th Army HQ unit — almost got a corp HQ on the same turn, but a retreating Russian infantry managed to just cover it from a mobility movement attack. The more we delved into Masuria, the more we liked some of the clever mechanisms. The Corp HQ offered a neat decision dilemma: bring it forward to coordinate attacks, add factors, and get replacements in the front line, or, hang back because if you lose them, they don’t come back and no replacements show up for that corps. From time to time, the Russians lost them and we, erroneously, brought them back as a replacement using the 10th Army HQ. With the mobility move, even leaving them near the front line is fraught with hazard. The resupply for both HQ and Corp artillery is well done, too – makes you appreciate railroads for logistics. We are of two minds regarding the ‘mobility’ move. On the one hand, we like the mechanic and the restrictions placed on the mobility phase. On the other, the defender is paralyzed and cannot respond to a threat even though a turn equals one day. Reserves stay put, units stay put, and this is an advantage to the German because he goes first and can often disrupt the Russians from any counterattack. When the Dennis and the Czarists launched strong attacks on Turn one of the third game, the Germans got a localized thrashing, but held on enough to surround half a dozen units, snow or no snow. Speaking of snow, this is the one die roll that will heavily determine the winner of the game. In the second game, snow fell on only one of 10 turns. 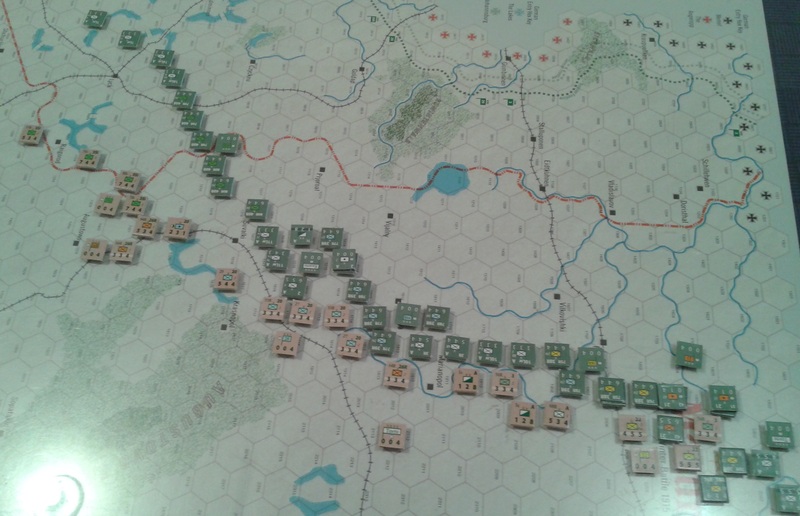 The Germans thrashed the Russians, and that’s without using the mobility phase until the latter half of the game. In Game three, snow fell from turn two through five – Germans could only batter away with frontal charges and low odds with 50% chance of an EX (in open terrain). On turn six, out came the panzers…er, leg infantry. On the plus side, snow turns moves along because you can’t move far or do much in terms of finesse attacks. That is a problem from a gaming point of view (or at least my gaming point of view). Dice are dice, of course, fickle as can be, but the weather roll determines, perhaps overly determines, the pace of attack and the ability of the Germans to surround Russians for the all-important VPs. It’d be interesting to see how many turns historically would be considered snow. Wikipedia notes the German attack was launched in the middle of a snowstorm and advanced 70 miles (17-18 hexes) in one week (seven turns). 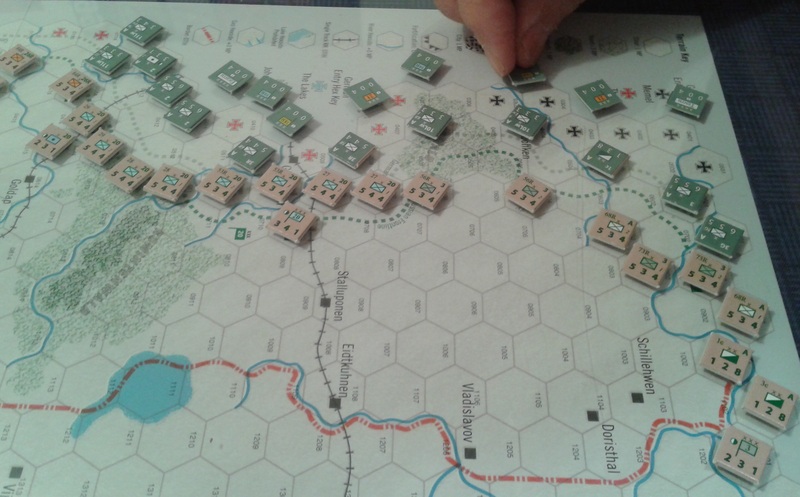 In our Game the second, the Germans gained about 13 to 15 or so hexes in eight turns, with only one of them a snow turn. In our Game the third, the Germans gained about 10 hexes in six turns. You need a better source than Wikipedia for a more precise weather answer, but if you want historical movement rates, you need Clear weather. Finally, the infantry units having only one step (instead of two) show an excellent translation of historical operations vs OOB. That’s not just clever, it’s cool. We initially thought it was a misprint on the counters! Hey, to be fair, the map has a misprint on the terrain effects chart. Masuria costs $19.95 and offers a neat little game good for at least a few playings. We never played the entire game out, as it seemed somewhat decided (albeit with various misinterpretations of the rules) when we stopped. We figured between 20 to 30 minutes per turn — a little more for the initial German turns and a little less for snow turns. An 18-turn game would last six to nine hours and certainly not the 1-2 hours as listed – maybe we think too much, because Masuria makes you think and that’s a big plus in a small game. Here’s a summary of the rules answers Chris Perello provided. On the terrain effects chart, light woods cost 1 Movement Point (MP), heavy woods cost 3MP. Fortress hexsides are treated like river hexsides – if an attacking unit is ‘behind’ the fort hexside, the defender does NOT get fortress benefits and the attack is considered taking place in the clear. 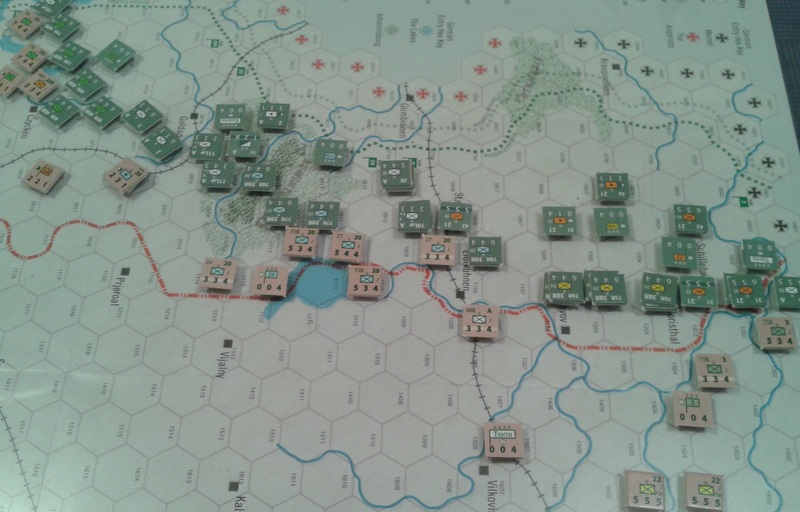 On entry onto the map, the first hex entered uses up half the unit’s MPs. If in an enemy zone of control, it cannot infiltrate (until next turn), but may (assuming it has the movement) exit the EZOC to a non-EZOC hex and then enter another EZOC. Corp artillery units that are NOT adjacent to its parent corp HQs are halved in the attack. All units are considered capable of mobility movement and attack. All units are capable of attacking twice in one turn (once during regular combat and once during mobility combat). Some German units only have one step – this is not a misprint. HQ units, once lost, are never replaced. The intrinsic Russian fortress garrison is eliminated if forced to retreat. However, if the Germans do NOT advance to garrison the fortress, or ever neglect to keep a garrison in a fortress, it reappears at full strength. Replacements do occur during Snow turns. After a couple weeks and a couple e-mails, Chris declined to send a response. Personally, I take that to mean he agrees 110% with everything written or implied within this AAR/Review….right? Posted in Masuria 1915 and tagged Eastern Front, Masuria, Russian Front, World War I Games. Bookmark the permalink. Very nice review of Masuria. I am currently reading the rules of Masuria and Tannenberg and soloing before playing it face to face. I have also experienced some confusion due to duplication of the F&M rules and the Exclusive rules of this package. Your review clarify many things, thanks.